Renew your love of blue with the casually cool Bavello loveseat. Its textured indigo-hue upholstery is a welcome sighting in a sea of beige. 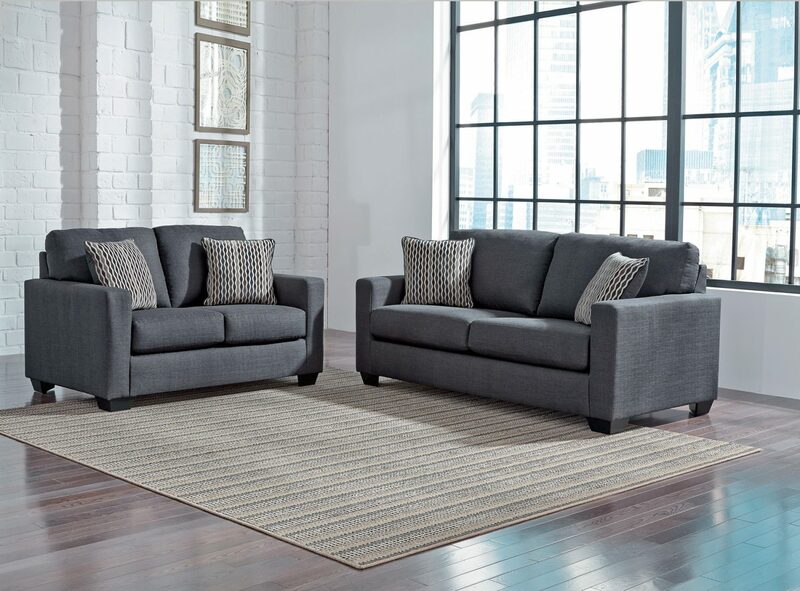 Track arms and a 2-over-2 cushion design enhance a clean, crisp aesthetic that simply works. Pair of diamond weave pillows add to the contemporary vibe. Bonus 2x Accent Cushions Included with each lounge. Frame constructions have been rigorously tested to simulate the home and transportation environments for improved durability. Corners are glued, blocked and stapled. Seats and back spring rails are cut from 7/8” hardwood. Stripes and patterns are match cut. All fabrics are pre-approved for wearability and durability against AHFA standards. Cushions are constructed of low melt fiber wrapped over high quality foam.